In a historic session that began yesterday and has gone on throughout the night and into the morning, the Assembly Republicans appear intent on pushing through as many of their bills as possible before the session ends. March 16, 2012, 3 AM, Assembly Gallery. State patrol outnumber observers two to one. Pundits speculate this blatant and overwhelming power grab playing out on the last day of session is instigated by the Republicans who see their majority position coming to a close. With the upcoming recall elections, and a newly-engaged populous educated far better than when this crop of corporate-driven legislators took office January 2011, Republicans are well aware their majority days are very well numbered. 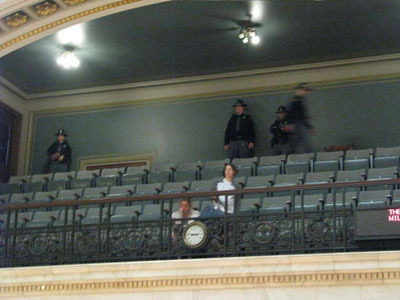 As citizens of Wisconsin, we urge you to tune into www.wiseye.org and watch firsthand what is really happening, not what the corporate media may or may not report on. The need for an informed citizenship is a key to return our state to it’s progressive roots and overcome this disregard for the democratic process. If and when these bills become law, chances are most of the citizens of this state will wonder how we got there. Don’t be one of them. Turn off mainstream television and watch history in the making. Then educate your friends, family and neighbors on what is happening to the government of Wisconsin. wiseye link doesn’t work. Error message saying it’s not found. Thanks for all your work, which I doubt you get paid for on a citizens site like this. WisconsinEye link worked for me.